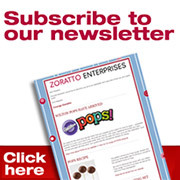 Zoratto Enterprises is a family owned and run business. 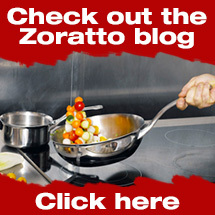 Established in 1966, our aim remains the same; that is to deliver quality products and service at a competitive price. Over the years our business has grown and diversified to accommodate the ever changing retail market. We continue to import the best in stove top coffee percolators and kitchen accessories from Europe, as well as developing and expanding our ranges of cast iron cookware, table and baking ware. Our newest ranges in Bakeware, Party Accessories, and Cake Decorating continue to support our standing as one of the industry’s leading wholesalers of quality Cake Decorating & Kitchenware. We make it easy...You make it amazing! For 85 years, Wilton has been the industry leader in cake decorating, quality Bakeware and food crafting. They are the number one resource for decorating classes in the USA, proven supplier of professional Wilton decorating Bakeware and provide step-by-step information online and through publications to help you make your celebration special with Wilton cakes, cookies, cupcakes and candy. Available for the first time in Australia, Zoratto Enterprises proudly presents Madame Loulou by Rue Flambèe Italia. Rue Flambée produces and distributes quality products that are GMO free, use AZO free colours and are without hydrogenated fats. Rue Flambée Italia is a young and modern company, with years of experience gained though the pastry, confectionery, catering and foodservice industries. The wide range of innovative products including coloured roll fondant, royal icing, magic gelato and lace decor caters for different tastes, textures and colours, and allows the user to create high quality, delicious desserts and inviting appetizers in a simple and quick way, without compromising creativity. Regarded as the silicone specialist in the Bakeware, Silikomart offers an extensive range of silicone baking moulds and accessories, all Made in Italy. Silikomart invests in advanced manufacturing systems, using only the best raw materials in accordance with strict qualitative standards, a fact that distinguishes Silikomart from many of its competitors. Silikomart’s products are carefully tested and are FDA and CE compliant. Vev Vigano is a family owned business, which has been in production since 1972. Vev Vigano is one of the few remaining Italian companies producing Italian made Coffee Percolators, and is the largest manufacturer of stainless steel coffee makers in Italy. De Buyer was founded in 1830 in the Alsace-Lorraine mountains in the east of France. Still in the same location today, De Buyer is run by the same family that bears its name. More than 180 years of experience, De Buyer is highly acclaimed as a leading manufacturer of top-of-the-range cooking and pastry utensils for the elite chefs of France and the world and discerning home gourmet cooks. To invest in a de Buyer quality is an investment for life. A manufacturer of tea kettles, Copco offers many styles in an array of colours and stainless steel finishes. Features are incorporated that address comfort and safety such as heat resistant, ergonomic handles and various whistles mechanisms to fit consumer preferences. Copco now has evolved into thermal mugs, carafes, barware, kitchen storage, organisation and food preparation.